I love Giant Couscous. I buy it from the International Supermarket at the end of the High Street, Walthamstow, from TFC in Highams Park or the kosher shops in Stoke Newington where it is known as Israeli Couscous. Is it me or is Tesco taking over? It makes me sad. It has claimed the skyline at Highams Park. I really don’t want local shops to decline further because we as consumers want convenience. I love searching for foodie gems, I know the time arguments but food give so much joy and eating is something that we have the luxury of doing up to three times a day in the UK so I think that we should do it well – not expensive but with thought. I like couscous – fine, medium and especially giant which are small, round, pasta-like, toasted grains made from semolina and wheat flour. Also known as ‘matfoul’ and ‘kuskus’, it is popular across the Middle East and Turkey. This couscous has a nutty flavour and makes a great substitute for rice in pilafs and risotto-type dishes. It can also be used cold in salads or as a thickener in home-made wintery soups. On it’s own it is bland so I use chicken stock instead of water to boil it in and then you can experiment with flavours. Heat about 500ml of water in a pan and dissolve the stock cube. Add the couscous and make sure it is all covered, bring to the boil and then add a lid to the pan, reduce the heat and simmer for about 10 minutes. Meanwhile in another pan quickly boil the mange tout for about 3-4 minutes, drain and set aside. Slice the mushrooms and gently fry them in a big pan in a glug of olive oil in a big pan, add garlic if you want at this point. 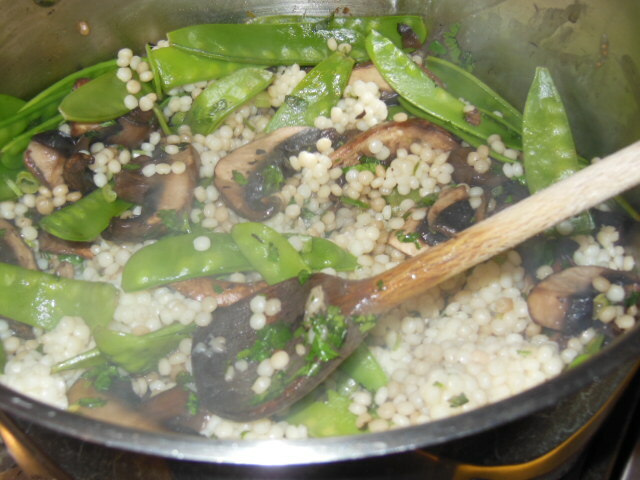 Add the mange tout, the cooked couscous, spring onions, mint, coriander and lemon juice and season with salt and pepper. Stir through to mix the flavours. Serve warm with grilled chicken or fish or as a vegetarian dish on it’s own. It would work well with parmesan on top, and the vegetables could be substituted for peas or french beans. What’s your favourite couscous recipe? This entry was posted in Recipes, Shopping in E17 and tagged Couscous, giant couscous, Highams Park, international supermarket, kuskus, matfoul, Middle East, Olive oil, shopping foodie gems, Stoke Newington, turkish food centre, Walthamstow. Bookmark the permalink.